When the Wright brothers accomplished their first powered flight more than a century ago, they controlled the motion of their Flyer 1 aircraft using wires and pulleys that bent and twisted the wood-and-canvas wings. This system was quite different than the separate, hinged flaps and ailerons that have performed those functions on most aircraft ever since. 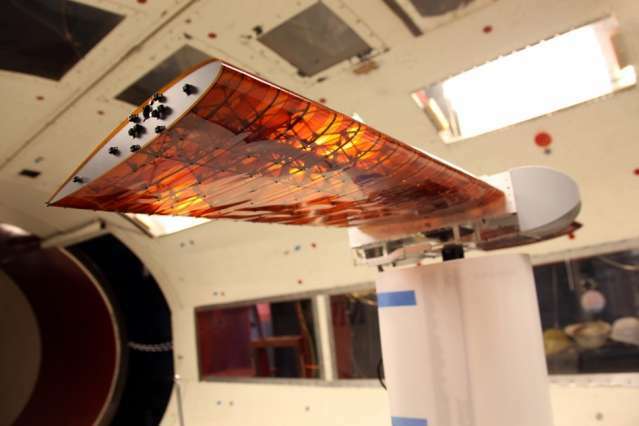 But now, thanks to some high-tech wizardry developed by engineers at MIT and NASA, some aircraft may be returning to their roots, with a new kind of bendable, "morphing" wing. The new wing architecture, which could greatly simplify the manufacturing process and reduce fuel consumption by improving the wing's aerodynamics, as well as improving its agility, is based on a system of tiny, lightweight subunits that could be assembled by a team of small specialized robots, and ultimately could be used to build the entire airframe. The wing would be covered by a "skin" made of overlapping pieces that might resemble scales or feathers. The new concept is described in the journal Soft Robotics, in a paper by Neil Gershenfeld, director of MIT's Center for Bits and Atoms (CBA); Benjamin Jenett, a CBA graduate student; Kenneth Cheung PhD '12, a CBA alumnus and NASA research scientist; and four others. Researchers have been trying for many years to achieve a reliable way of deforming wings as a substitute for the conventional, separate, moving surfaces, but all those efforts "have had little practical impact," Gershenfeld says. The biggest problem was that most of these attempts relied on deforming the wing through the use of mechanical control structures within the wing, but these structures tended to be so heavy that they canceled out any efficiency advantages produced by the smoother aerodynamic surfaces. They also added complexity and reliability issues. By contrast, Gershenfeld says, "We make the whole wing the mechanism. It's not something we put into the wing." In the team's new approach, the whole shape of the wing can be changed, and twisted uniformly along its length, by activating two small motors that apply a twisting pressure to each wingtip. This approach to the manufacture of aircraft, and potentially other technologies, is such a new idea that "I think we can say it is a philosophical revolution, opening the gate to disruptive innovation," says Vincent Loubiere, a lead technologist for emerging technologies and concepts at Airbus, who was not directly involved in this research. He adds that "the perspectives and fields this approach opens are thrilling." The basic principle behind the new concept is the use of an array of tiny, lightweight structural pieces, which Gershenfeld calls "digital materials," that can be assembled into a virtually infinite variety of shapes, much like assembling a structure from Lego blocks. The assembly, performed by hand for this initial experiment, could be done by simple miniature robots that would crawl along or inside the structure as it took shape. The team has already developed prototypes of such robots. The individual pieces are strong and stiff, but the exact choice of the dimensions and materials used for the pieces, and the geometry of how they are assembled, allow for a precise tuning of the flexibility of the final shape. For the initial test structure, the goal was to allow the wing to twist in a precise way that would substitute for the motion of separate structural pieces (such as the small ailerons at the trailing edges of conventional wings), while providing a single, smooth aerodynamic surface. Building up a large and complex structure from an array of small, identical building blocks, which have an exceptional combination of strength, light weight, and flexibility, greatly simplifies the manufacturing process, Gershenfeld explains. 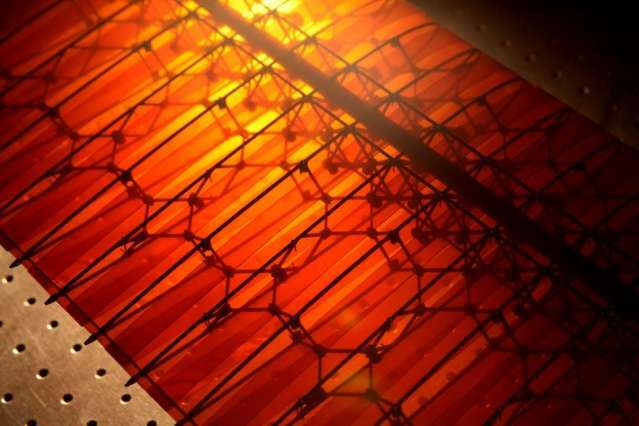 While the construction of light composite wings for today's aircraft requires large, specialized equipment for layering and hardening the material, the new modular structures could be rapidly manufactured in mass quantities and then assembled robotically in place. Gershenfeld and his team have been pursuing this approach to building complex structures for years, with many potential applications for robotic devices of various kinds. For example, this method could lead to robotic arms and legs whose shapes could bend continuously along their entire length, rather than just having a fixed number of joints. This research, says Cheung, "presents a general strategy for increasing the performance of highly compliant —that is, 'soft'—robots and mechanisms," by replacing conventional flexible materials with new cellular materials "that are much lower weight, more tunable, and can be made to dissipate energy at much lower rates" while having equivalent stiffness. While exploring possible applications of this nascent technology, Gershenfeld and his team consulted with NASA engineers and others seeking ways to improve the efficiency of aircraft manufacturing and flight. They learned that "the idea that you could continuously deform a wing shape to do pure lift and roll has been a holy grail in the field, for both efficiency and agility," he says. Given the importance of fuel costs in both the economics of the airline industry and that sector's contribution to greenhouse gas emissions, even small improvements in fuel efficiency could have a significant impact. Wind-tunnel tests of this structure showed that it at least matches the aerodynamic properties of a conventional wing, at about one-tenth the weight. The "skin" of the wing also enhances the structure's performance. 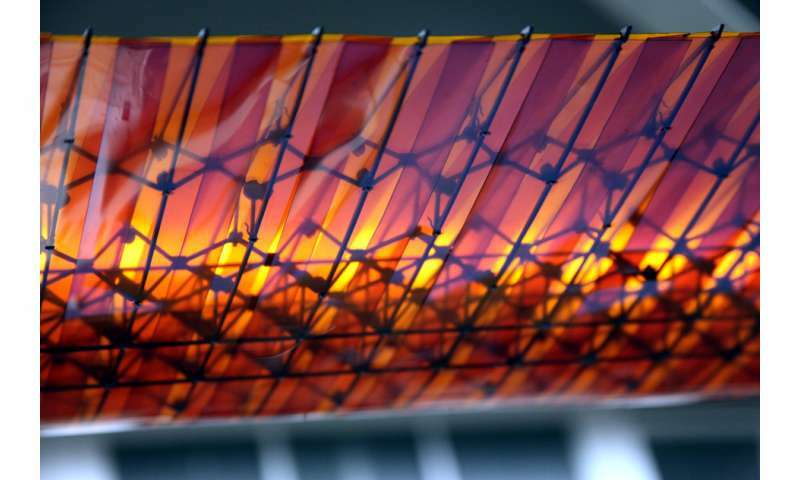 It's made from overlapping strips of flexible material, layered somewhat like feathers or fish scales, allowing for the pieces to move across each other as the wing flexes, while still providing a smooth outer surface. The modular structure also provides greater ease of both assembly and disassembly: One of this system's big advantages, in principle, Gershenfeld says, is that when it's no longer needed, the whole structure can be taken apart into its component parts, which can then be reassembled into something completely different. Similarly, repairs could be made by simply replacing an area of damaged subunits. "An inspection robot could just find where the broken part is and replace it, and keep the aircraft 100 percent healthy at all times," says Jenett. Following up on the successful wind tunnel tests, the team is now extending the work to tests of a flyable unpiloted aircraft, and initial tests have shown great promise, Jenett says. "The first tests were done by a certified test pilot, and he found it so responsive that he decided to do some aerobatics." Some of the first uses of the technology may be to make small, robotic aircraft—"super-efficient long-range drones," Gershenfeld says, that could be used in developing countries as a way of delivering medicines to remote areas. "Ultralight, tunable, aeroelastic structures and flight controls open up whole new frontiers for flight," says Gonzalo Rey, chief technology officer for Moog Inc., a precision aircraft motion-controls company, who was not directly involved in this work, though he has collaborated with the team. "Digital materials and fabrication are a fundamentally new way to make things and enable the conventionally impossible. The digital morphing wing article demonstrates the ability to resolve in depth the engineering challenges necessary to apply the concept." Rey adds that "The broader potential in this concept extends directly to skyscrapers, bridges, and space structures, providing not only improved performance and survivability but also a more sustainable approach by achieving the same strength while using, and reusing, substantially less raw material." And Loubiere, from Airbus, suggests that many other technologies could also benefit from this method, including wind turbines: "Simply enabling the assembly of the windmill blades on the spot, instead of using complex and fuel-consuming transport, would enhance greatly the cost and overall performance," he says. Add artificial muscles, and one could just about make a birds wing! "super-efficient long-range drones," Gershenfeld says, that could be used in developing countries as a way of delivering medicines to remote areas." Yes, I know the type of medicines that would be deployed, the one that goes boom.